Please help us by taking a brief survey when about Voices, but clicking HERE. 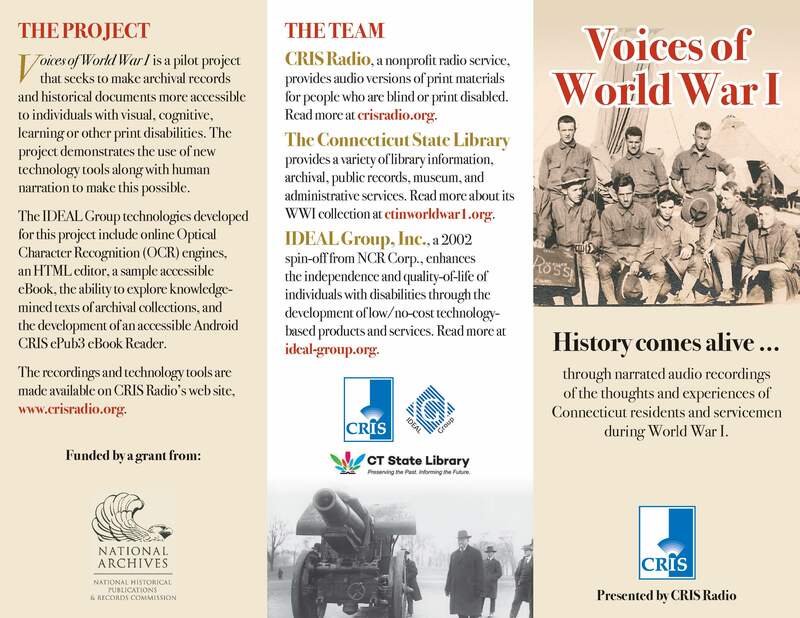 CRIS Radio, the IDEAL Group, and the Connecticut State Library (CSL) are working together on a collaborative pilot project to improve access to archival records and historical documents for individuals who are blind or unable to read due to other disabilities. 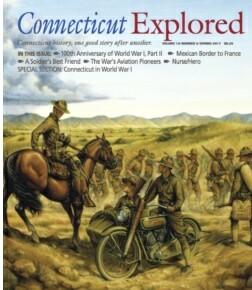 This partnership will integrate CRIS Radio's recordings of historical primary documents archived by the Connecticut State Library’s World War I collections with IDEAL Group’s eReading and Knowledge-Discovery online and Web-based technology, a tool that will significantly improve searching historical primary source documents. This new online technology will be available for free to the participating audiences through the CSL and CRIS Web sites. This pilot is funded by a $64,044 grant awarded by National Archives’ National Historical Publications and Records Commission. The purpose of this project is to demonstrate that archival records and historical documents can be made accessible to anyone, including people who are blind or have a range of print disabilities, by utilizing new technology tools coupled with human narration. Audio versions of the selected documents narrated with the appropriate emotion and proper syntax will be available as podcasts. Knowledge mining technology will offer online searching capabilities that enable students and researchers to quickly identify specific documents within archival collections. This new online tool will allow individuals to access the archives with a computer or mobile device, including a smartphone, tablet or e-book. The collaboration will feature the CSL’s World War I collections, including: letters to home; diaries; servicemen's war record questionnaires; state-produced pamphlets and; front page newspaper accounts during the war. The podcasts and knowledge-mining tool will be made available online on the Web sites of CRIS Radio and CSL’s World War I Web site. Site Lines: Connecticut’s World War I Memorials.